If you weren’t around in the 90’s, you missed a hell of a time for athlete marketing. Michael Jordan practically invented athlete endorsements, after the success of the Air Jordan 1 lead to more, and more and more And as his on-court success grew, so did his off-court profile. Athlete endorsements was an infant industry, where players would practically advertise anything for a dollar. Nowadays, it’s a bit more, lets say, professional. Mike jumped on everything from (ironically) hair care, promoting hotdogs, plugging McDonalds, fitting out tuxedos and slurping down Gatorade. Oh, and then there was his signature sneaker line, of course. The dude was a walking billboard for two entire decades. And as a result, Mike put together quite a showreel. And while his acting is terrible, there’s still some creative gems from over the years — and we’ve dug them out of the archive for you to reminisce over. So here we go, here’s 20 of Michael Jordan’s best TV commercials! Ok, I actually don;t even like this ad. It’s pure garbage, which is fitting for the Haynes brand. But I couldn’t not include it, due to Mike’s rather . . . Hitler-looking moustache. To no ones surprise, the style Mike was going for really didn’t take off. Spike Lee made plenty of appearances in Jordan commercials as Mars Blackmon over the years, but this one here for the Air Jordan 20 is one of his few appearances where he plays himself. The commercial has good music, it’s motivating, and he takes you down memory lane as he reads from a giant book. You literally couldn’t ask for anything else. Except for maybe some of Mike’s signature bad acting. This just sums up Mike’s mentality in one ad. And he’s still like this to this day, ready to beat down anyone in a one on one at the ripe old age of 55. Ahhh yes. Here’s our first example of Mike’s signature shocking acting. It also doesn’t help that all ads from the early 90’s were cheesy AF. Godamnit Billy. Stop forgetting the Coke. Mike’s got chips to win. I would argue that few things helped grow the Jordan brand more than the NBA banning the shoe. Here’s the ad that sparked the growth and kickstarted a the sneaker culture phenomenon. The ad would have placed higher if it wasn’t so damn boring to watch. This is the epitome of what makes Michael Jordan. No matter what failure or adversity he encounters, he is willing to do what’s necessary to succeed. It’s part of what has made him the best player to ever lace up a pair of sneakers. His pregame routine here shows him mentally preparing to destroy opponents. 13. Is it in you? This is probably the most beautifully pieced together commercial on the list. Not a single word is said, but you know exactly what Mike’s success runs off. “Is it in you?” is still one of the most memorable lines in marketing. It was a matchup of the young athletic freak taking on the old, wily veteran in Washington, an example of how much the physical and mental aspects of a person can change over time. This was a great way of cementing the time line that Jordan’s career had passed through. I think old Mike’s gonna win it, though. A great piece of marketing from the late 80’s — telling people it’s not the shoes that makes the man, but you should get ’em anyway because it’s the closest you’re ever gonna get to being like Mike. And it worked so damn well. 10. It’s gotta be the shoes! Money it’s gotta be the shoes! A statement that lives on with all the connections verbally linked to Jordan. 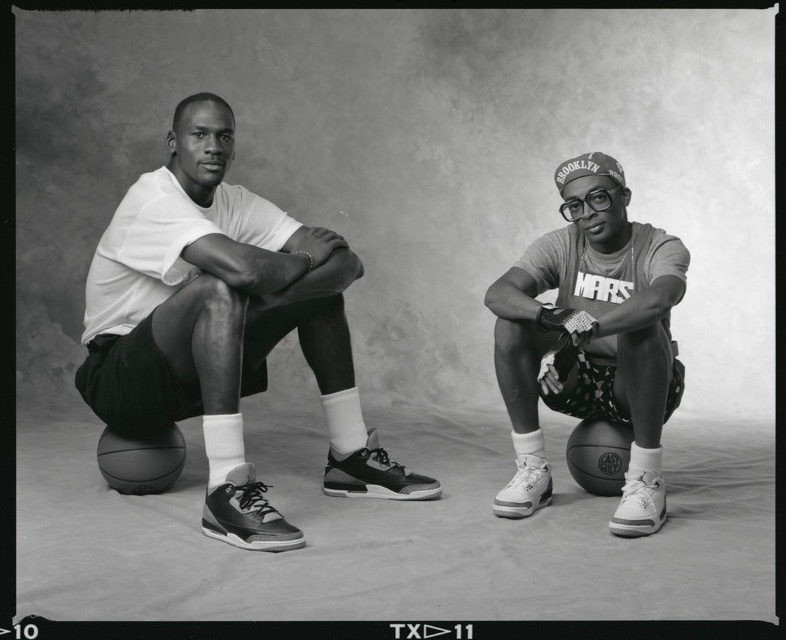 Mars Blackmon (Spike Lee) and Jordan are in another one of their classic commercials together as the Air Jordan was in its early stages of being promoted. I’m not as high on this commercial as others, but out of respect for the love people have for it, it has to be in the top 10, even if it’s only for Jordan’s truncated and simple “No Mars” reply. I like puns. Which is probably why I loved the dry sense of humor of Bugs Bunny as a kid. This commercial has plenty of puns, and Bugs Bunny, and horrible acting. It’s got 90’s written all over it. Even for how bad it is, it’s perfect. Ok, this is kind of a Jordan commercial, right? Kind of. This faux infomercial was deployed by Nike as a comic campaign to generate hype and talk around the Jordan and Nike Brands. Plus, Charlie Murphy is the GOAT. It had to be included. The catchphrasem whether you want to be him or not, was “Be Like Mike.” It sticks with anyone named Mike or Michael in athletics and any basketball player who attempts to ascend to Jordan’s greatness. It stuck around and was modified every time Jordan won a title. After he beat the Lakers (1991), Blazers (1992) and then Suns (1993), the chorus was updated with slightly different video clips. This is a video that came out of nowhere it seems. From back in 1986, you can just tell that Mike was out of his depth on screen. But it’s damn funny to watch. And ironic — a bald man plugging hair care. And the Jingle that’s sung by (I think) Luther Vandross is as smooth as can be. Damn I loved the 80s. All that is missing here is Don Cornelius. This is a commercial I only remember because of the shoe. It’s simple enough, but also cheesy in that it’s another ad based of his ability to Air. But you know, It’s memorable — and that’s all it needs to be in advertising. 4. Who is Johnny Kilroy? Steve Martin x Michal Jordan. The second best duo behind Mike and Bill Murray in Space Jam. The concept was cool — very 90s indeed —and the execution is a sign of the times. So who is Johnny Kilroy anyway? This whole commercial is just weird and unsettling. There is so much going on here — the Family Ties-style intro, the weirdness surrounding Mike’s answer and his wife’s answer, then his old man has the nerve to ask about him and his mom. Strange AF. Then you get the obligatory fast cuts of the product that was oh so 90s — like the Dockers ads. Add to that a cheesy jingle and a slow mo shot of Mike and you have every 90s TV commercial cliche right here. The beginning to what became the global icon that is “Air Jordan.” As illustrated by this video, Jordan’s shoe literally took off once it hit the market. The actual in-flight announcement is incomparable for sports commercials. This is the commercial that made Michael “His Airness” and had kids of all ages flocking for his shoes. The NBA might have banned these shoes from being used in games, but that didn’t stop the kids from looking stylish in them. A great shoe and a great commercial. The good old game of horse. It seems like everyone has played it at sometime in their lives. Well, Jordan and Bird decided to step it up to Big Mac status with the burger on the line. Thankfully Legend Larry was on top of things and withdraw dunks from the competition, otherwise it would have been over. I only wish we could have had a winner eventually — my money’s still on Larry.